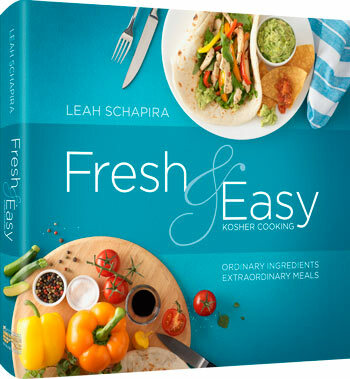 Leah Schapira’s new cookbook, Fresh & Easy Kosher Cooking: Ordinary Ingredients, Extraordinary Meals (Artscroll/Shaar Press) features kosher versions of contemporary American favorites. The book is now in its second printing after selling out its first printing of 13,000 in about a month. Of course, you need not follow the Jewish dietary laws to enjoy her recipes. 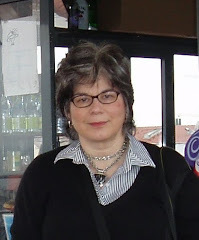 Schapira, a food journalist specializing in kosher food, is co-founder of the popular website and recipe forum Cook Kosher . Her specialty is creating recipes that reflect current culinary trends and translating them into kosher to easy-to-make, easy-to-source dishes perfect for holiday, Friday night or even weeknight dinners. Recipe inspirations range from Mexican, Asian, Italian, Middle Eastern as well as traditional Eastern European Jewish influences and American favorites. Almost all ingredients are available from regular supermarkets. There are lots of color photos illustrating the recipes. Small photos are used in the table of contents and to show recommended side dishes for some recipes, design features I found helpful and appealing. The recipes are clearly written, often give alternatives in preparation or ingredients, and are for the most part fuss free. When a recipe requires more technique (such as making and baking pizza), Schapira gives very detailed instructions (with photos). I especially liked her “traditional” chapter where she gives some fresh takes on symbolic foods for Shabbat and holiday dinners ranging from Beet Leaf Patties for Rosh Hashanah to Square Donuts for Chanukah. The recipes below are from Fresh & Easy Kosher Cooking: Ordinary Ingredients, Extraordinary Meals by Leah Schapira/November 2011 (www.artscroll.com/freshandeasy). I have adapted them very slightly for space and to reflect my experience. This article and the recipes first appeared in my column in the j weekly and the recipes are used with permission. I made the shredded beef and served it as a main course over potatoes. Serving it that way instead of as a sandwich reduced the serving size to four from eight. I have also made this dish very succesfully in a pressure cooker. Schapira’s version of the honey mustard chicken is accompanied by a photo of the dish cooked with the peppers but the recipe itself leaves the type and amount of vegetables up to the user. I liked the idea of the peppers and included them in my version. Place meat into the slow cooker. Top with brown sugar onion slices, soup mix and garlic. Pour ketchup and beer over meat. Cover and cook on low for 8-10 hours or on high for 5 hours. Remove the meat. Strain the liquid from the slow cooker; discard solids. Reserve liquid. Use two forks to shred the meat, discarding any large pieces of fat. Place shredded meat back into cooker and pour half the strained liquid over it. Cover the slow cooker and cook on high for 20-30 minutes. Serve in buns or rolls with desired toppings. Cut chicken into 2” strips of even thickness. Season with salt and pepper. Heat oil in a large frying pan over medium heat. Add onion and cook for 10-15 minutes or until golden brown. Add chicken and cook for 5 minutes. Add vegetables if using. Add honey, mustard and soy sauce. Cook for 10-15 minutes, stirring occasionally, or until sauce reduces. (If chicken is cooked through before the sauce is reduced as much as you would like, remove the chicken from the pan, keep warm, and add back in after the sauce has thickened.) Serve over orzo or rice. Honey Mustard Chicken! That is a recipe that sounds delightful. Thank you for putting it up and I'll make sire to make it for me and my husband very soon.